What type of trophies do you most desire? What is the longest it's ever taken you to download a file on PSN? How many people have you blocked? We shouldn't tread over the topic or plot of the original video. Do you suffer Trophy OCD? What is your average daily trophy goal? Earning at least one trophy is considered a worthy achievement in my book. What's the rarest trophy on your profile that you HAVEN'T earned? 4 achievers and 0.01% ultra rare. Minecraft for the PS3, PS4, and PSVita are a fun and easy three platinum trophies. How many unearned trophies do you have? Anything over a 4/10 difficulty, lol. I'm bad at this stuff. The purpose of adding friends on PSN...? I don't really play with them anymore, but in my "heyday" of playing online multiplayer games, I would start a lobby of several of them, shoot the breeze, and catch up on stuff. I mostly play single player games now, due to the fact that I am online less and don't have as much time. 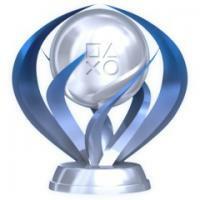 What was the first trophy you ever earned? This one, earned way back on December 13, 2011. Planned Milestones: -Level 15/20 -1,000 trophies - 10 platinums -1337 trophies Should be simple enough, at the rate I'm going anyways.